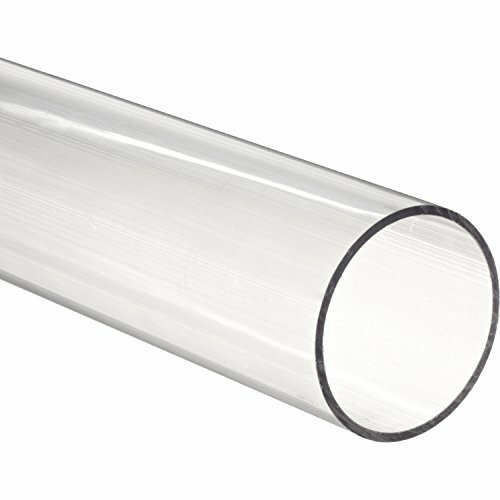 These extruded acrylic tubes are strong, lightweight, and shatter resistant. Acrylic (PMMA) is an economical alternative to polycarbonate with high tensile and flexural strength properties. Acrylic has exceptional UV tolerance and is virtually unaffected by years of weather and sun exposure making them a preferred material for outdoor and marine applications. These acrylic tubes can be used in any number of applications including industry, science, plumbing, design, models, aquariums, crafts, and much more. Acrylic is easy to work with, can be sawed, drilled, painted, decorated, glued, and formed. It is often specified due to its moderate properties, ease of handling, and affordability. The clarity of these extruded tubes is very good however some may have noticeable extrusion marks from the manufacturing process. Cast acrylic is available if a more polished surface is required. Acrylic (PMMA) does not contain potentially harmful bisphenol-A. If you have any questions about this product by Plastic-Craft Products, contact us by completing and submitting the form below. If you are looking for a specif part number, please include it with your message.